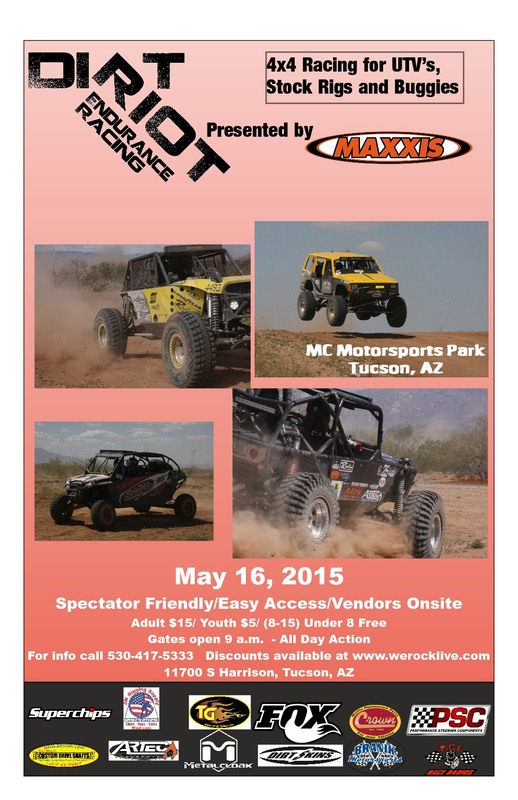 BLACKFOOT, ID MAY 13, 2015: Welcoming the Arizona sun, the Dirt Riot series heads to the Southwest of Tucson, Arizona for the Trail Boss Offroad and Pirtek Southwest second race. Racing will start at 9am on Saturday May 16th with multiple classes of racing until approximately 4:30pm when the top 3 drivers in each class will be awarded trophies and cash winnings. The winners of each race is determined by the most number of laps completed in a set amount of time. Pro class qualifying will be at 5:30pm on Friday night. Pre-registered in the Pro 4400 4×4 Class includes Goodall Racing Kenneth Goodall, Fly-N-Hi Racing Jeremy Hammer, Isenhour Motorsports Dustin Isenhour, and LetzRoll Offroad Racing Alan Johnson among others not already pre-registered. An additional pre-registered Pro Driver included in the 4500 Class is Sparks Pro Racing Julie Sparks. Pre-registered in the Pro UTV Class is Undertakers Racing Frank Minice and in the UTV Class is Funk-N-Fast Off Road Brad Witbeck. The SuperMod Trail Class pre-registered racers are Short Bus Mafia Racing Carlos Gonzales, Kroger Racing Paul Kroger, Bad Boyz Racing, Chris Langen, Bad Boyz Offroad Nick Langen, Tyler Racing, Paul Tyler, and AZ Racing Joe Whitcomb. Racers can sign up and register on site during tech and registration Friday May 15th. Admission is $15 for adults, $5 for ages 8-15, children 7 and under free and Military with ID get $5 off. Order your tickets now: http://conta.cc/1KxMslm There are vendors, food and amenities on site. We encourage you to bring chairs and shade structures. There is camping available onsite. For additional details go to http://www.werocklive.com/events/dirt-riot-southwest-round-2-3. Sunday, All Terrain Hero will be hosting their Race * Run * Walk event with all the proceeds going to The Gwendolyn Strong Foundation. All levels of participants are welcome. More information and signup at www.allterrainhero.com.